Watch for the oyster sign! “We have the only chenin blanc in New York State,” asserts our server, so we are interested to taste the wine made from this French grape. But more about that later. 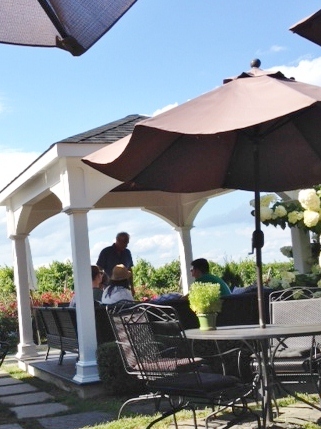 On this beautiful late summer afternoon, the outside deck is filled with small groups enjoying the weather and Paumanok’s menu of raw oysters ($25 for a dozen) or large variety of cheese or charcuterie plates from Catapano goat farm and Lombardi’s Market. Most people elected to sit outside on this beautiful day. 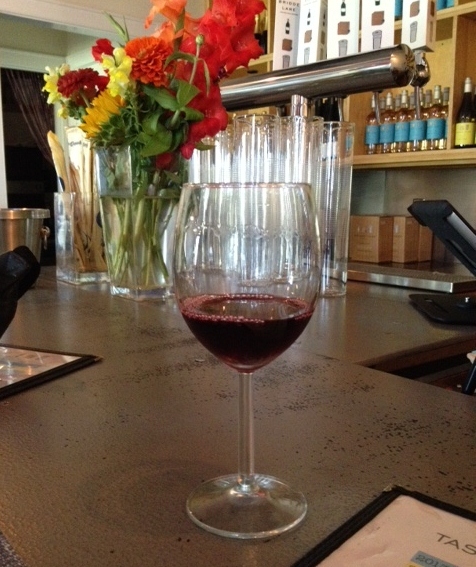 The tasting room is small, but we manage to find room at the bar where we assess our choices. The tasting menu lists nine options, from one taste of their sparkling wine to four whites or four reds for $12 each flight. We opt to share one of each, but that still does not get us tastes of all their wines, in particular most of the Festival line. Maybe next year. 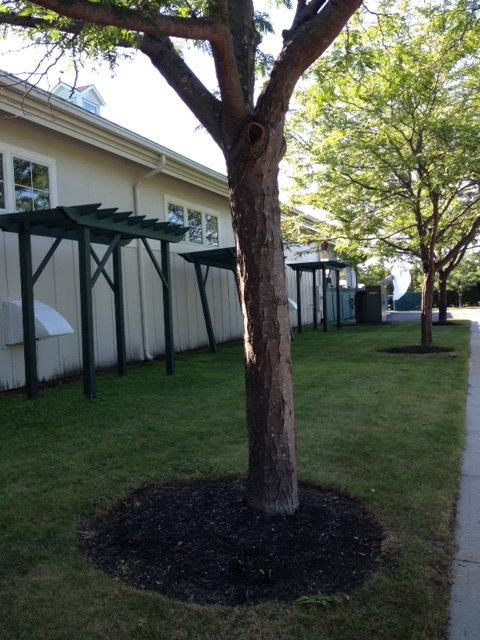 The sign outside says “Winery of the Year,” but I’m not sure what that is based on. 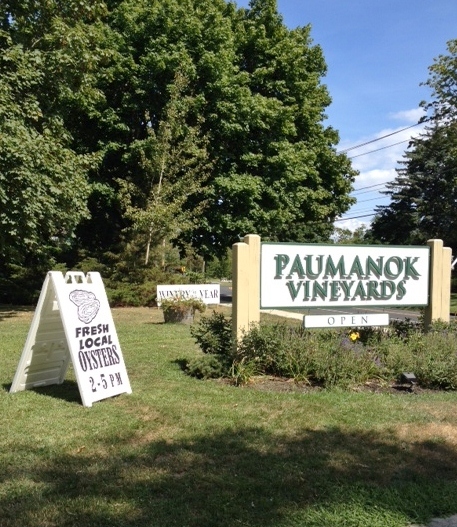 However, it is a pleasant place, especially in the good weather when you can sit outside; the wines, while none of them send us into outer space, are fine; and I have to favor a place that quotes Walt Whitman on their labels (Walt, born on Long Island, liked to use the Native American name for Long Island—Paumanok—in his poetry.). The gift area has a small selection of t-shirts and other gift items, but no volumes of Whitman’s poems! If we had decided to have oysters, this is the wine I would have chosen to have with them. The aroma is grassy and minerally, the taste tart and lemony with some tropical fruit notes. Excellent. I suppose because the bar is crowded, our server pours our tastes two at a time, which is good, because the wines are too cold, so our deliberate style of tasting—sniff, discuss, take notes, swirl, taste, discuss, take more notes—gives them time to warm up a bit. This is also a pleasant wine, a touch sweeter than the Sauvignon Blanc, with not much smell. We decide we taste some sweet orange, perhaps tangelo. A nice light summer wine, and you wouldn’t want to pair it with any food that was too assertive, as it would get lost. A good oaked chardonnay if you don’t like oaked chardonnays. Our charmingly French-accented server points out that they have a steel-fermented chard on the Festival list, as we discuss the differences between steel versus oak and what we like about each. We also notice that almost all the wines have screw caps, a boon to the corkscrew-use-challenged. This is not overly oaky, with a toasty aroma and some vanilla taste, but not too sweet. “A crowd pleaser,” we decide. I think it would pair well with shrimp. The riesling about which we disagreed. My husband, a riesling fan, doesn’t particularly care for this one, which he finds not “riesling enough.” I like it. It has a bit of that cat pee aroma, plus some apple. Our server says it has green apple tastes, and we agree, and would add a touch of Key lime citrus. Simple and refreshing, this is a good riesling if you are not particularly a riesling fan. 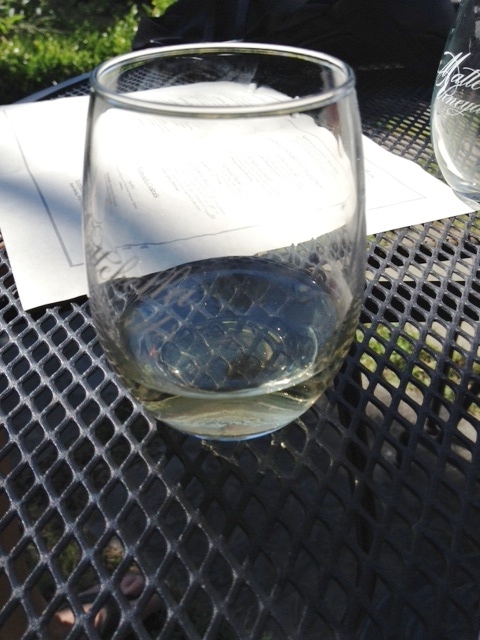 If you are counting, you realize that this is our fifth out of four white wine tastes, which we get courtesy of our server who, noticing our seriousness, wants us to try a different style of riesling and gives us a small sample of a wine from a different flight. This is fairly sweet, almost candy-like, also relatively simple, and not to our taste—but it might go well with Thai food. The label says this “should be enjoyed with red meat,” but I would say not too red. Maybe pork chops or veal or a cheese plate, as it would not stand up to a big steak. A blend of 52% cabernet sauvignon and 48% merlot, this has a slightly piney aroma and is quite drinkable. It is mellow, not complex, with a touch of tannin. “I get a tingle on my tongue,” says my drinking pal. Eh. No aroma, not much taste,rather underwhelming. Pischochs, I say, which my husband says I can’t use in a review. It’s a Yiddish term meaning…watery. One of the servers gives us some more information on this wine, noting that 2013 was a very good year, and that this wine, a combination of mostly cabernet franc with “a touch of merlot,” drinks more like a pinot noir than a cab. I would agree. It is another nice wine, with a bit of a funky and blackberry smell and cherry and berry taste. It’s not powerful, though it has some depth. Our server, who reveals she is from Toulouse, is pleased when we note that this is actually a Bordeaux blend, a mixture of 16% merlot, 2% petit verdot, and 86% cabernet sauvignon. After she steps away we add to each other “Bordeaux light.” Aromas of cherry, oak and red candy; tastes of red fruit, maybe plums, pleasantly dry. Not a serious wine, we decide, but like almost all the wines we tried, fine. At this point, we notice that there is no tip jar, which is too bad, since we would definitely have left a nice tip. If we had elected to buy four bottles the cost of one tasting would have been deducted from the total, but we decide we don’t want any of the wines enough to buy four bottles. However, there is nothing wrong with any of them (except that merlot! 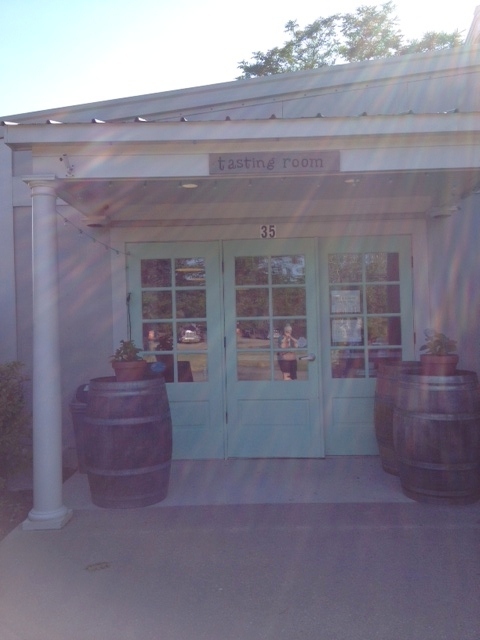 ), so I wouldn’t cross this winery off your list if you were planning a visit. 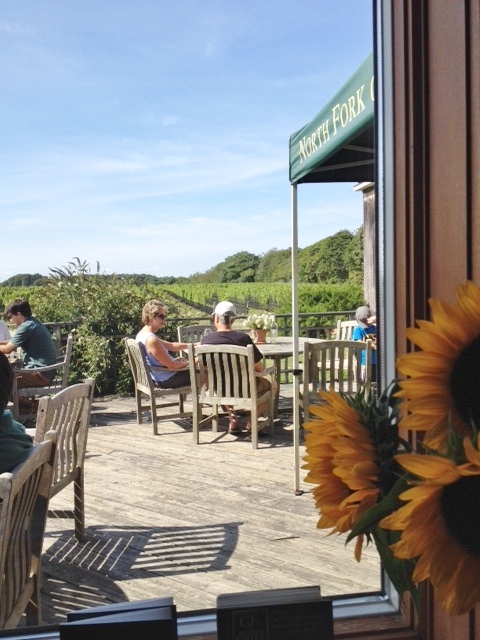 It is particularly a good place to sit outside and get one of their food items with a glass of wine. I’d recommend the Sauvignon Blanc with oysters or the Festival Red or Cabernet Sauvignon with a cheese or charcuterie plate. 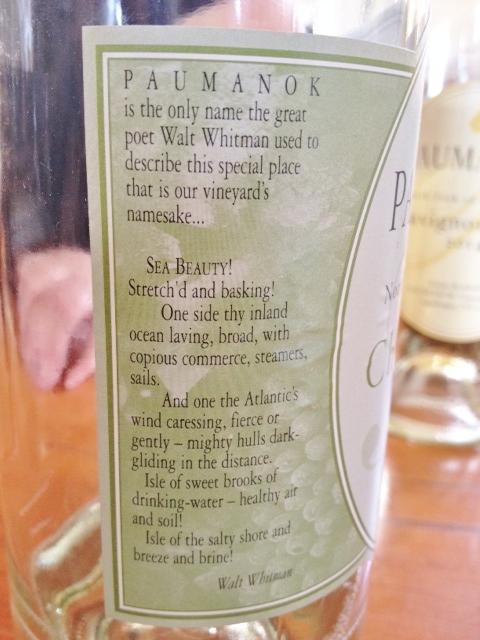 I love that they quote Walt Whitman on the label! 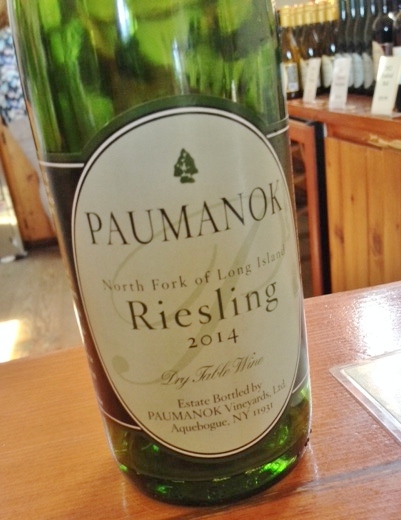 Reasons to visit: the Sauvignon Blanc, the only Chenin Blanc in New York State, the Festival Red, the Cabernet Sauvignon; a nice outside deck where you can enjoy their cheese or charcuterie or oysters with a glass of wine; labels that quote Walt Whitman. 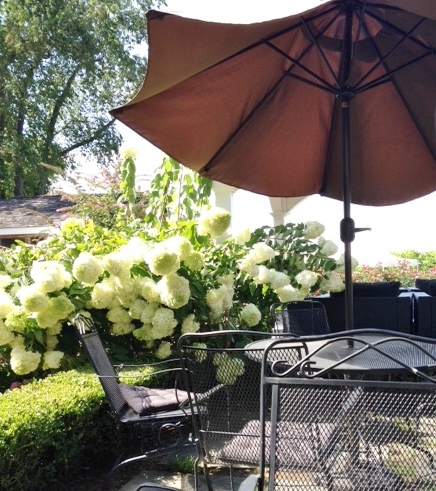 One view of the outside deck. 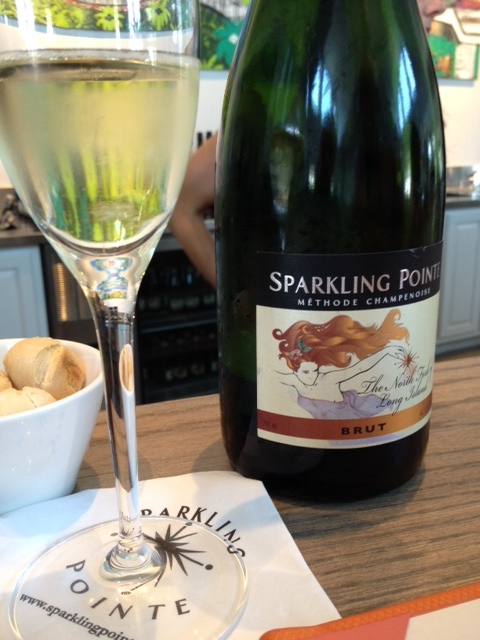 Every time we visit Sparkling Pointe we go home convinced that we should drink more champagne—or, to be precise, more sparkling wines, since only wines from the Champagne region of France can actually be called champagne. 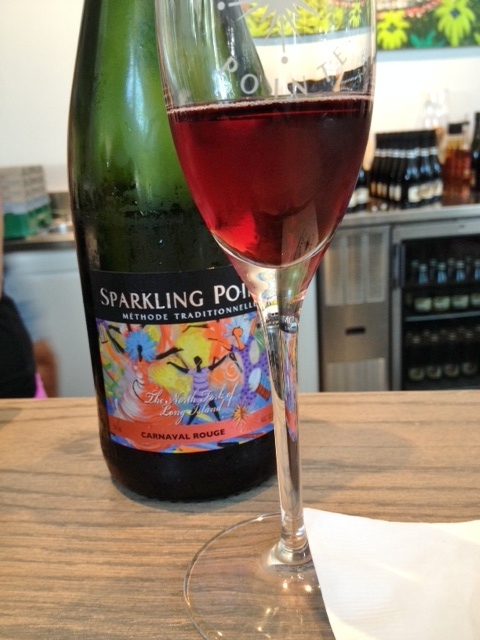 Sparkling Pointe only makes sparkling wines, a focus that disappointed a couple who wandered in as we were enjoying our tasting and left, despite the best efforts of our very knowledgeable and passionate server to persuade them to stay. 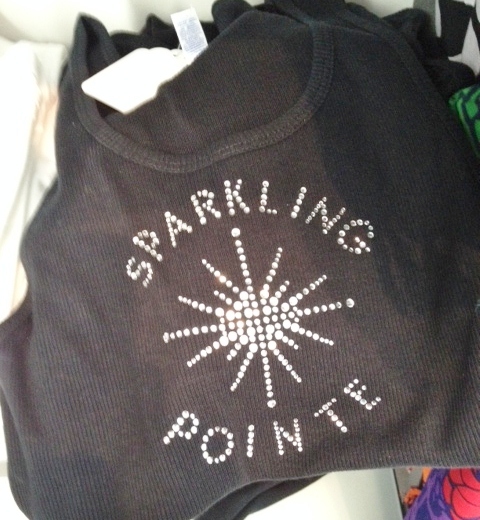 “Here,” she offered, “try a little sample on me of two very different sparkling wines,” pouring them tastes of the Brut and the Carnaval. They should have stayed. 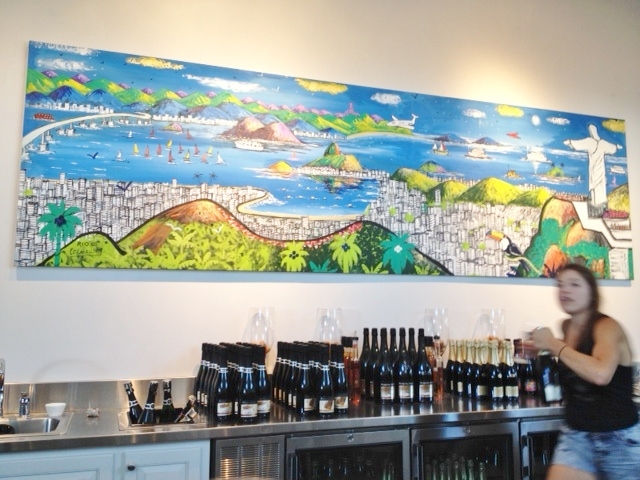 The tasting room is a bright, airy space, decorated with large crystal chandeliers and paintings of Brazilian scenes (because the owners like the culture of Brazil, we’ve been told). 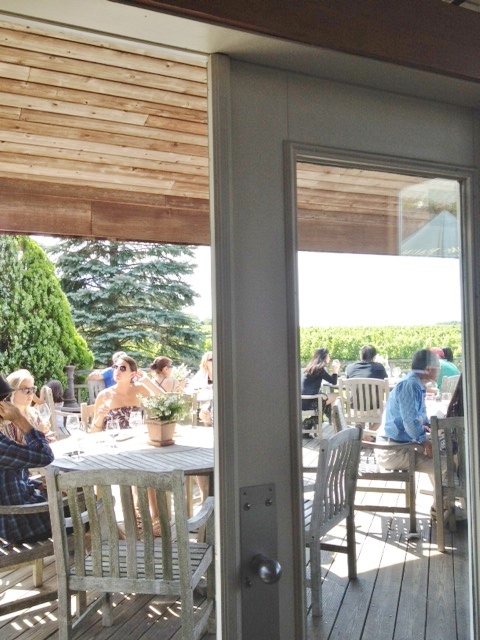 Outside there are more seats on a shaded patio overlooking the vineyard. We could have opted for table service inside or outside, but, since there is room at the bar, we decide to stay there, which gives us a chance to observe the somewhat frenetic actions of the serving staff, as they quickly move from task to task. “Like a beehive!” observes my husband. Our attentive server not only (noticing our interest) gives us more information about each wine than I can cover in my notes, she also gives us an extra taste, about which more later. The menu offers four tastes for $17, each one in a fresh champagne flute. 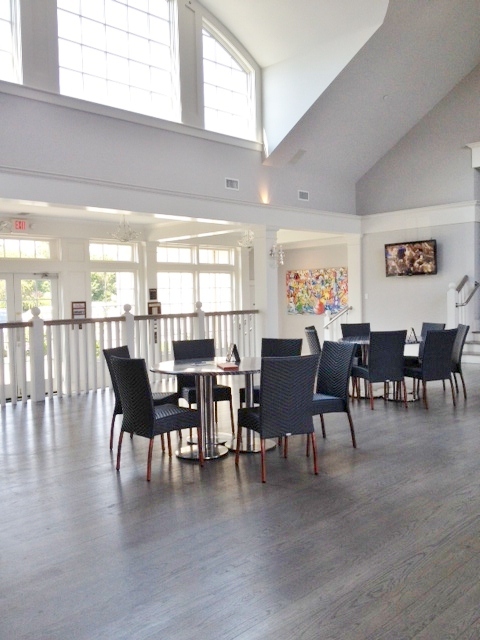 There is also an extensive menu of snacks—almost all of them of New York State origin, including cheeses and charcuterie, chips and olives, and Tate’s cookies—which is good, since they don’t allow outside food. 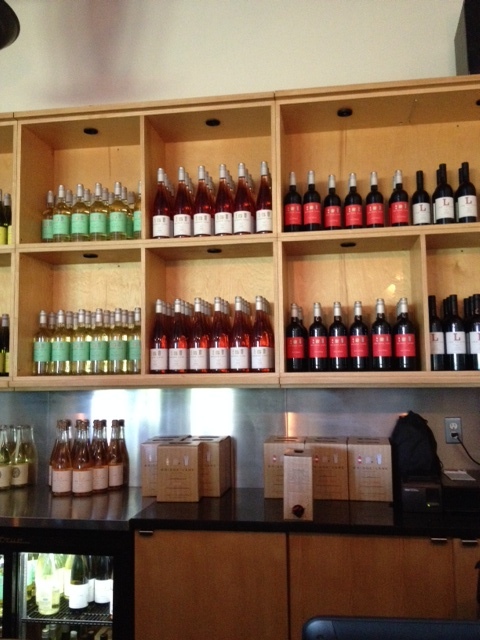 We also noted quite a few people ordering whole bottles for a table, plus snacks. The shop off to one side is full of gift items, also featuring many New York State grown or made products, as well as the sparkling t-shirts many of the servers wear. This is their least expensive and most popular wine, a non-vintage blend, meaning they strive for consistency year to year. This one is made from 38% chardonnay, 38% pinot noir, and 24% reserve wine—which means they use some of the wine they reserve from each vintage in order to make up the blend. It ages for two years on the lees. The aroma is toasty and yeasty, the wine itself very pleasant, with tiny bubbles that burst on the tongue. The chard probably accounts for the lemony taste, more like a touch of lemon peel than fruit. The wine is nicely dry, but could have more fruit flavors. I think it would be better as an accompaniment for food than by itself. Pretty label. 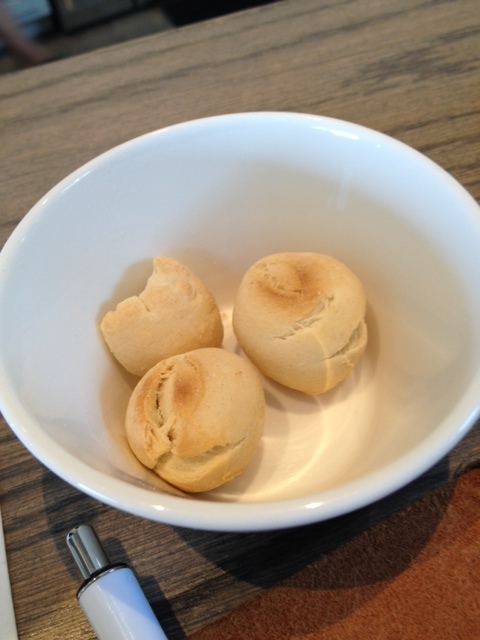 We clear our palate with our own individual bowl of round crackers, a nice idea—almost ruined by a man who comes to the bar to order a bottle for his table and helps himself to a handful. An observant server quickly dumps the bowl and gives us a fresh one. Nice! This one is a 100% chardonnay, aged 3 ½ years on the lees, with a slightly funky green apple smell. This has tastes of lime and mineral and fruit, and, though not complex, is quite good. 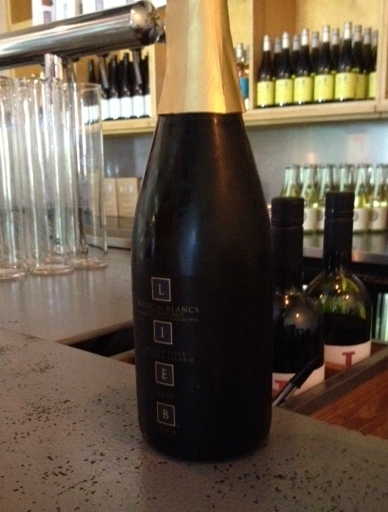 We recently had the Lieb Blanc de Blanc, made from pinot blanc grapes, which tasted very different. We prefer this one. Now we’re getting serious. They only make the Brut Seduction in a good year for pinot noir, which is not every year on Long Island, as this is 54% pinot noir and 46% chardonnay blend. This one has been aged eight years, and it shows. Wow. The aroma is yeasty and toasty again, but we also smell some bitter almond. Mineral, fruit, layers of flavor—we’ve had excellent vintage champagnes (yes, from France) and this would give some of them a run for their money. Our server thinks it needs another six months in the bottle, which would make it perfect for New Year’s Eve. The tasting menu says it has a “super organoleptic profile”—which is a fancy way of saying it appeals to all the senses. Yes indeed. The servers are smart and attentive and know a lot about the wines. 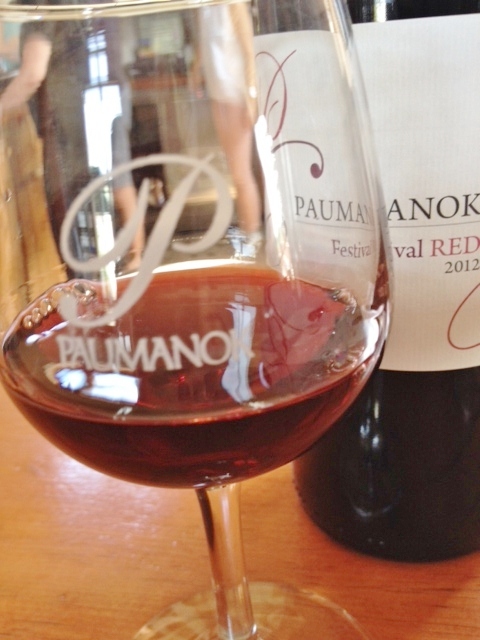 Our favorite–not counting the ’05! Not for sale, not on the menu, but we get a taste. The server has noted our seriousness, and my note taking, and we have had a great discussion of sparkling wines. She is so enthusiastic about them that she actually traveled to Champagne, France. The ’05 earned scores in the 90s, and we can see why. We smell a more complex aroma, with fruit and spice, perhaps fennel, and the taste…I wrote OMG. This could definitely stand up to a French vintage champagne. Our individual dish of crackers, which we almost lost! From the sublime to…not our taste. This is described as a demi-sec red sparkling wine, made from 65% merlot, 23% pinot noir, and 12% chardonnay, having spent five days on the merlot skins, which accounts for the pretty garnet color. The aroma is black raspberry, the taste is candy, or raspberry syrup mixed with seltzer. Unlike the others, which are made in the méthode Champenoise, this is made in the méthode traditionelle. If you like sweet, you can try this. I would skip it! 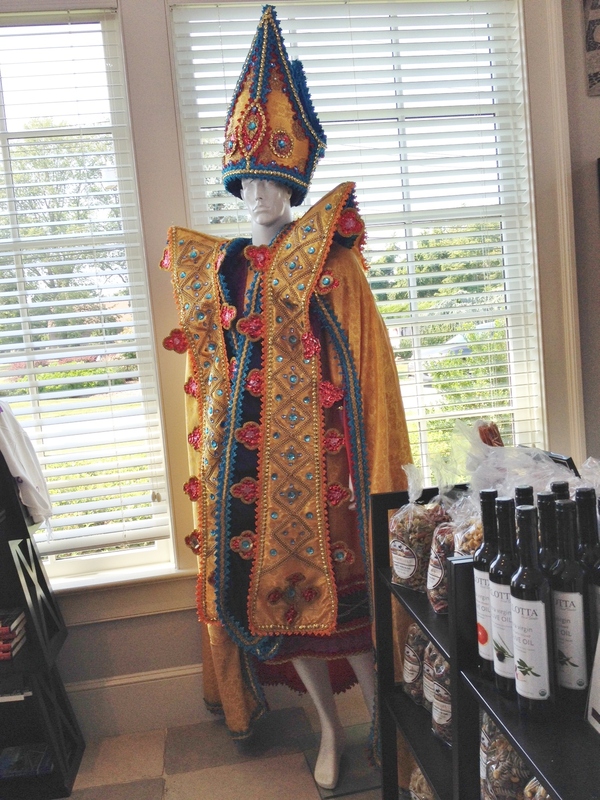 A carnival outfit from the gift shop to get you in the mood for our last taste. 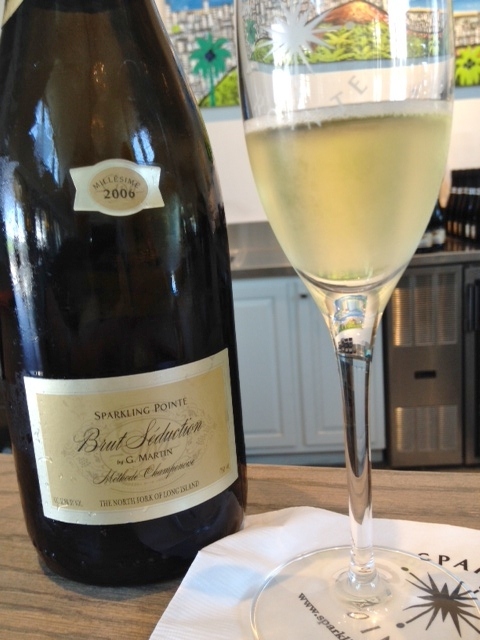 Reasons to visit: you like bubbles; the only winery that only makes sparkling wines; an airy pleasant setting with table or bar service; lots of interesting snacks; smart, attentive servers; nice little gift shop; the ’06 Brut Seduction. 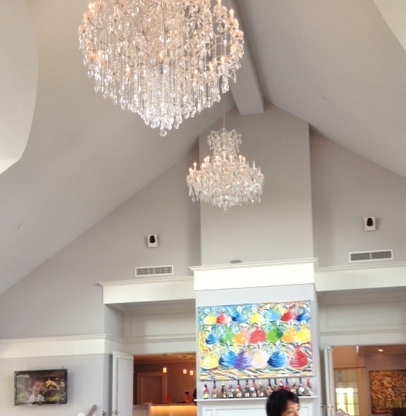 A view of the room during a brief quiet moment. In a few years, these grapes will sparkle. “So first you’re going to try the 2009 chardonnay and the 2013 steel chardonnay,” our charming server explains, pointing out the ways in which they compare. She also sets down in front of us two pieces of baguette topped with double cream brie, about which more later. Mattebella gives you the opportunity to make side by side comparisons of their wines, and in the process you can learn some interesting aspects of wine making, which I’ll tell you along with my discussion of each wine. We started to compare our experience with doing a fun science experiment. 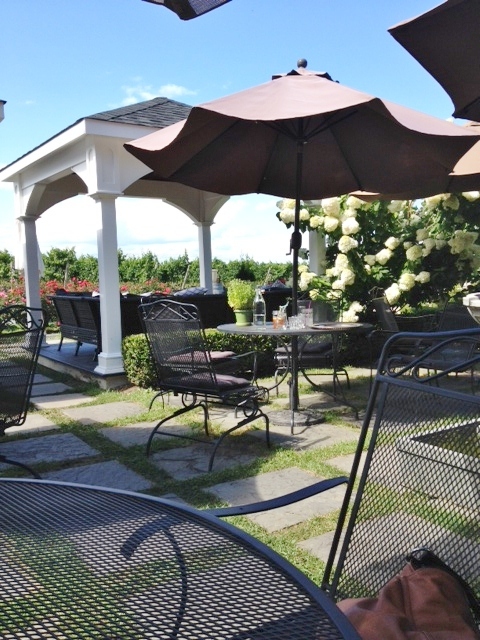 Another attractive feature of the winery is their beautiful outdoor patio setting, with a variety of comfortable seating surrounded by lush hydrangea and rose bushes. 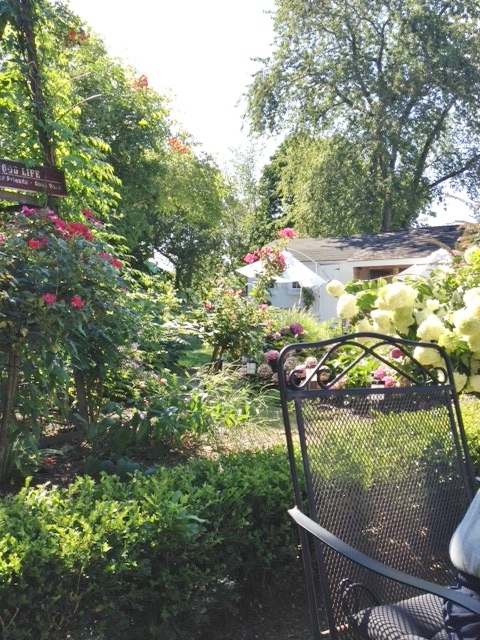 The tasting “cottage” itself is quite small, so this is a place we reserve for beautiful days when we can sit outside and relax while being served. Others clearly think so, too, for though the patio was very quiet when we arrived, several groups walked in shortly after we did and all seemed to be enjoying the experience, including one group of young people who entered into a lively discussion with Mr. Tobin, the owner (with his wife, who was also there) of the winery. 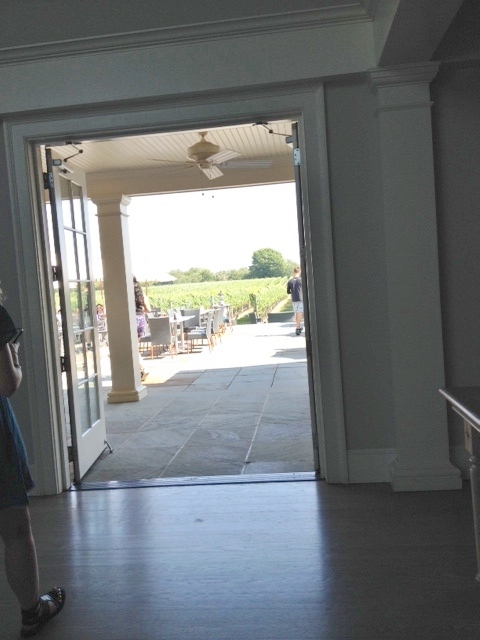 It is quite a family place, as evidenced by the active participation of the owners in the tasting room, the name of the vineyard—named for their two children—and the name of most of their wines: Famiglia, Italian for family. Mr. Tobin entertaining a group. Service is warm and personal, and the wine tasting includes some small tastes of food, since they believe that food affects how wines taste. 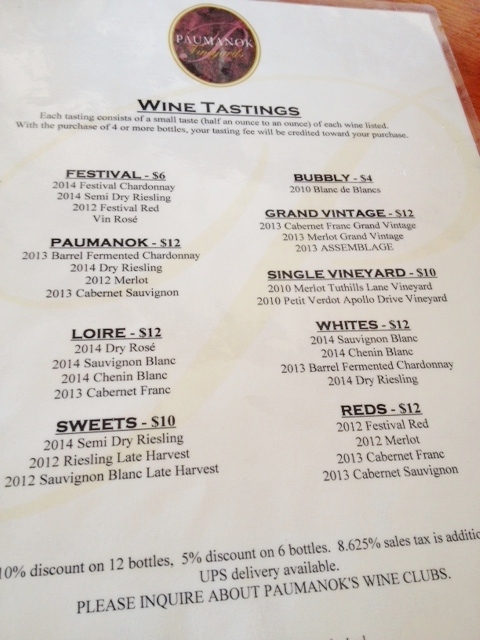 The menu has two main options: the Light Flight is $17 for 6 whites and 2 rosés, or the Red Flight, $19 for five reds. (Note—they do not accept American Express, though they take other cards.) You can also order individual tastes for $2-$6, glasses of any of the wines, or a glass of their wine cocktail or sangria for $14. Non-drinkers can order their house-made lemonade or water. We decide to share one of each flight, so we can try all the wines. Though there are a lot of tastes on the menu, our server tells us that it is a one ounce pour, so we figure we can handle it! We thought the server might have been a little confused when she set two glasses down on the table, but she soon explained that she was serving two wines side by side so we could compare them. 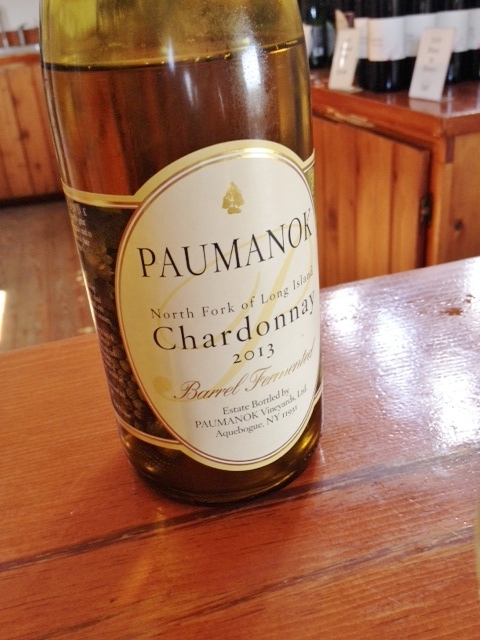 The 09 is an oaked chard from a cold season, she noted, which made it fairly “crisp and sharp” and an interesting foil for the 2013 steel-fermented chardonnay. She also set down a pretty pottery plate with two pieces of baguette topped with double cream brie. She recommended that we experiment by tasting each wine, then taking a bite of the cheese, and then sipping the wine again to see how having it with the creamy cheese changed the effect of the wine. Okay! 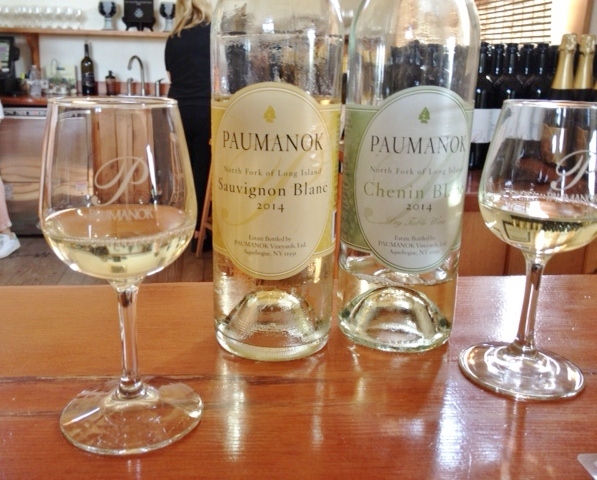 The ’09 has a perfume-y aroma of pear and citrus, with, says my husband, “a fair amount going on.” Once we take a bite of the cheese, we note more vanilla and baked pear tastes, as well as a surprising amount of citrus for an oaked chard. On to the ’13. 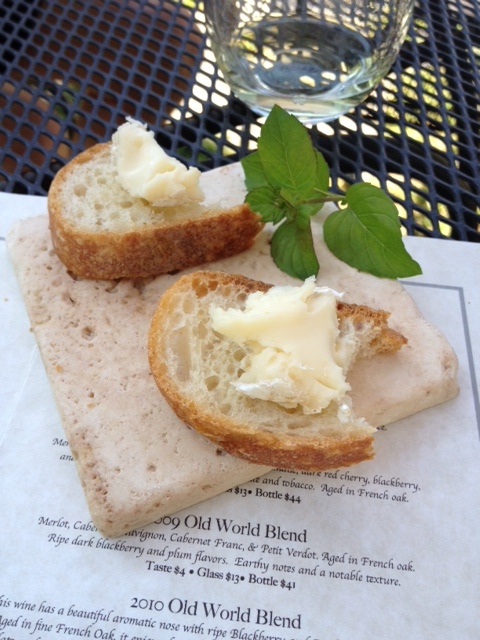 Double cream brie on baguette. Yum. The aroma is faintly grassy, the taste good, with some fruit but fairly dry, maybe a touch of bitter orange. We don’t see as much change with this one after the bite of cheese as the other, but it is a good complement to the cheese. Usually I think of red wine with cheese, but with a soft rich cheese I will now consider whites as well. Now we are asked to consider another pairing of the same grape, treated similarly (both lightly oaked, this one 20% oak and 80% steel fermented), but from very different years. 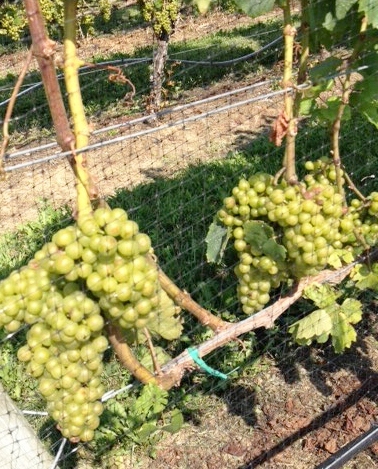 2010 is generally considered to have been a very good year on the North Fork, with warm dry weather which led to great ripening of the grapes. No surprise, this is a lovely rich chard, with great depth of flavor, the aroma grassy, fruity, and sweet. If we needed a white at the moment, we’d buy it. In contrast, 2011 was a very rainy year, and so the grapes contain a lot of water. Wow—this wine is waterier! Although it is only 5% oaked, the taste has lots of oak in it, perhaps because there’s not as much chard taste to counteract it. We smell the expected woodsy vanilla aroma, and the taste is quite light, almost evanescent. Our server characterizes this as a sipping wine. 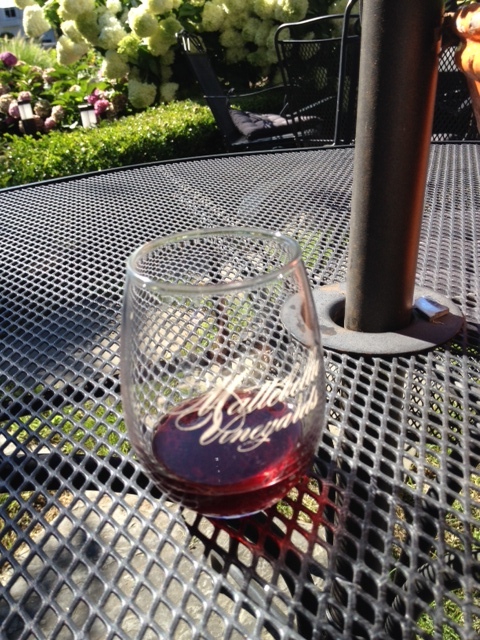 I think if you put an ice cube in it on a hot day you could almost forget you were drinking wine. Now we get to try two wines from the same vintage year, same grape, but treated differently. This is fun, we tell each other. 2012 was another good year. The Famiglia is 20% oaked, with aromas of vanilla, baked pear, and butterscotch. It is lighter than one might expect of an oaked chard (so for those of you who say “I don’t like chardonnay,” you need to try a bunch of differently treated chards), with some sweetness at first taste which then dissipates. Fine, but we like the 2010 better. This chardonnay has been 38% aged in French oak, and we have no trouble telling which is which just on appearance, since this wine has a darker gold color than the other. Mmm…smells good and tastes good, too. Lots of oak and fruit tastes, mouth-watering, “softer and sweeter,” opines my drinking pal. Very easy to drink. It would be good with spaghetti and fresh clam sauce or sautéed scallops, though you wouldn’t want it with anything too creamy. 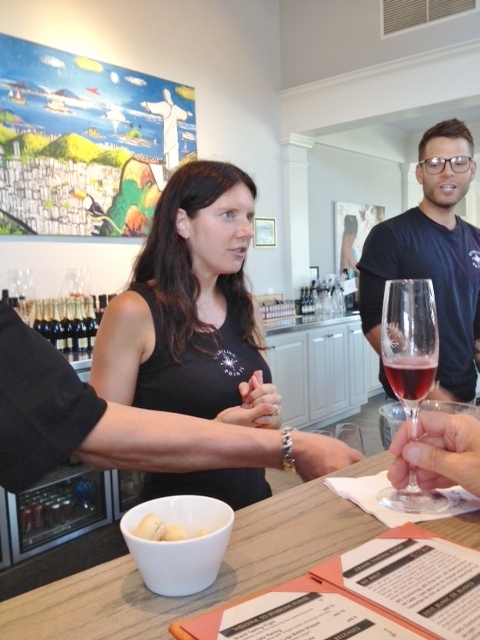 Mrs. Tobin stops by to say hello and give us a bit of background on the rosé. It is 90% merlot and 10% cabernet franc and chardonnay, she tells us; the merlot is a Pomerol, the 181 clone also used by Croteaux. The grapes are picked when they are still “crunchy.” We smell and taste strawberry, green apple, and a touch of lime. Very light. 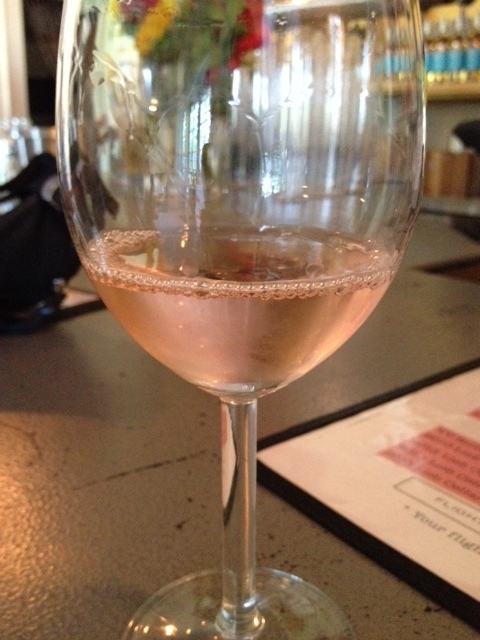 The “fun, party” sparkling rose. 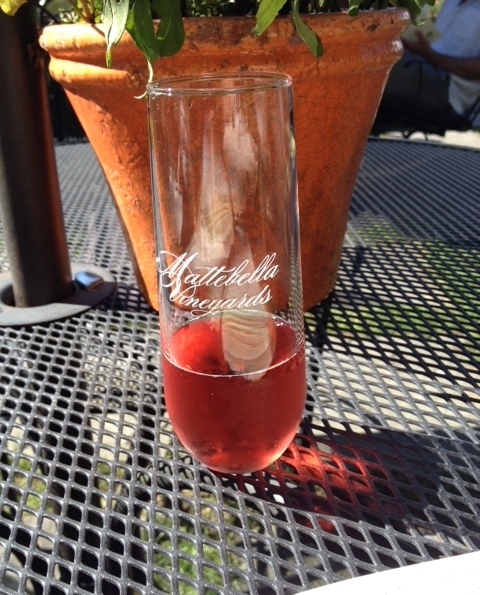 We get a new glass for the sparkling rosé, a tall slim one. This is a fun wine, Mrs. T. tells us, not at all serious, and the syrah grape juice accidentally spent too long on the skins, hence its dark pink color. Lots of over-ripe strawberry smells and tastes, almost soda-pop-y, this is much too easy to drink. I decide to dub it the bachelorette party wine, and indeed I observe the young woman at the next table order a full glass of it, while her companion opts for a glass of sangria. In 2012 we bought the Famiglia Red for $15, and last year it was $21, but prices do tend to rise, even on the non-vintage wines, though this is still a bargain compared to their other reds. This is a good everyday wine, and goes with pizza and pasta, as our server tells us. It spends a year in French oak, and then is put into steel to stop the aging. (By the way, Mattebella is one of the vineyards that uses the facilities at Premium Wine Group to produce their wines.) We smell leather and fruit, taste some cherry. 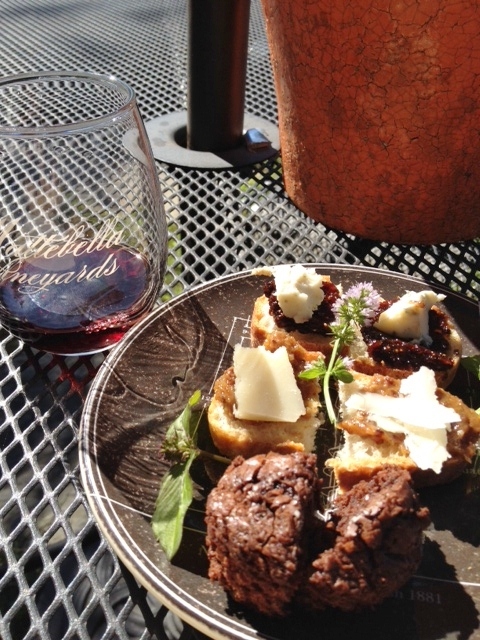 With this wine a small plate arrives with pairs of treats—fig jam and gorgonzola on baguette, bacon jam and grana cheese on baguette, and little bits of brownie—which we are advised to pair with our next wines. These are all Bordeaux blends, with varying percentages of the grapes. 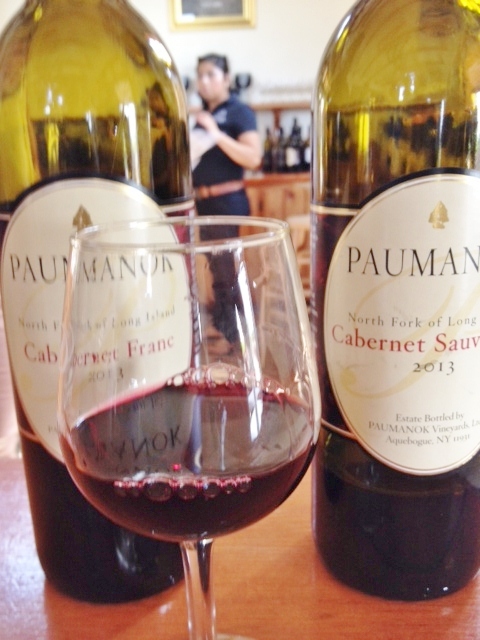 The ‘08 is 86% merlot, 7% cabernet franc, and 7% cabernet sauvignon (The petit verdot didn’t ripen in time, we hear.) We smell dark fruits, though the wine is on the light side. The taste improves after a bite of the yummy fig jam and gorgonzola, a combo I will definitely try at home. Since I asked about the percentages on the last wine, our intelligent server makes sure to tell me these: 93% merlot, 3% cabernet franc, 3% petit verdot, 1% cabernet sauvignon. Remember, this was a cold, rainy year. 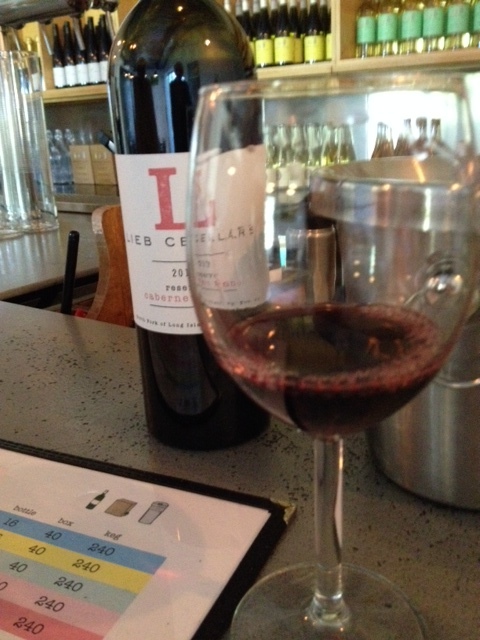 The wine is fairly tannic, with aromas of earth and minty candy, not very complex. Having it with a bite of bacon jam and grana cheese does help. Then again, what wouldn’t be helped by bacon jam!? 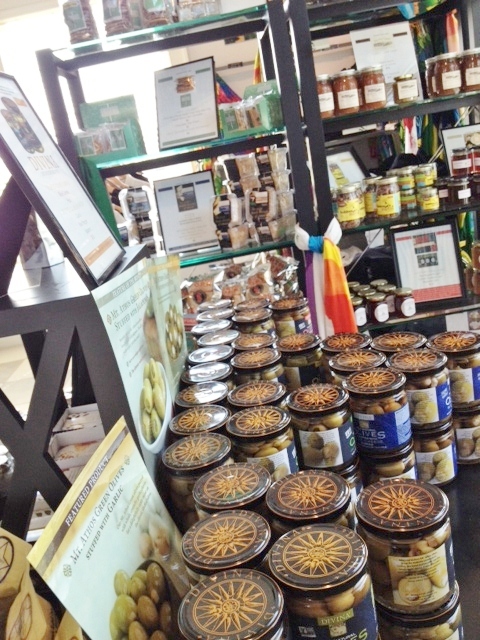 If you come here for a tasting, you will definitely understand the difference a year makes. We tend to forget that winemaking is farming, dependent on earth and weather, but this progression of vintages makes that clear. If their “biodynamic” farming methods are as effective in the fields as they are on the huge hydrangeas we are admiring, they must work amazingly well. The blend here is 88% merlot, 8% cabernet franc, 3% cabernet sauvignon, and 1% petit verdot, and we are also advised that this could be cellared for 4-5 years. We smell dark fruits, taste lots of cherry, a touch of chocolate, good tannins, though not a lot of complexity. It is good with the brownie! 84% merlot, 12% cabernet franc, 2% cabernet sauvignon, 2% petit verdot. Of course, they saved the best for last—and also the costliest. The aroma is delicious and so is the taste, with a “nice mouth feel,” says my pal. It is very good, but we have had the privilege of tasting world-class Bordeaux, which this is not—on the other hand, it doesn’t cost as much as they do, either! 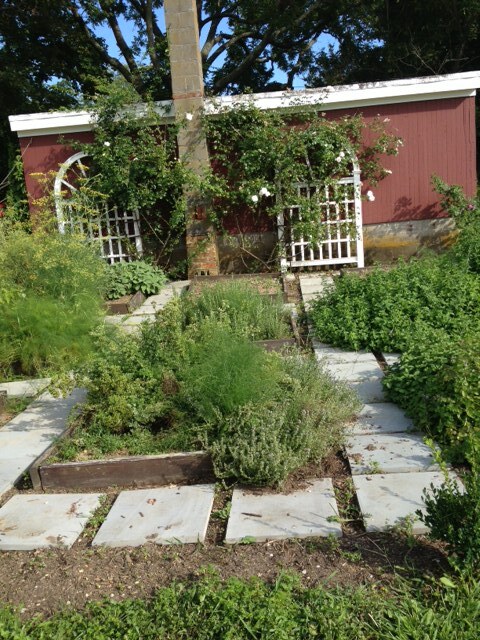 The herb garden near the tasting patio. Reasons to visit: a beautiful outdoor setting with friendly table service; the fun of experimenting with tasting wine with and without food (and where else is food included in your tasting? ); the fun of comparing vintages and methods of winemaking; a chance to learn about the influence of weather on grape crops and hence on the wines; the 2010 chardonnay; the 2012 Reserve Chardonnay; the 2014 Sparkling Rosé for a fun party drink; the Famiglia Red; the 2010 Old World Blend. 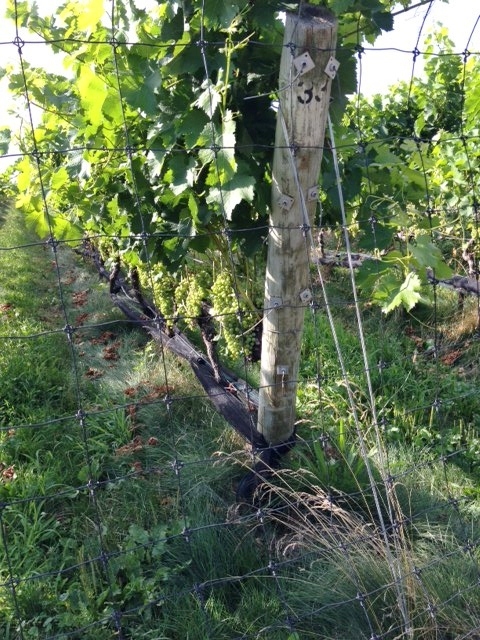 If you look carefully at this picture of the grape vines, you’ll notice that they don’t use herbicides. No, this winery has not entered the witness protection program or committed a crime; rather they have diversified their offerings to include both the lower priced options from Bridge Lane and their slightly higher end wines bearing the Lieb name. 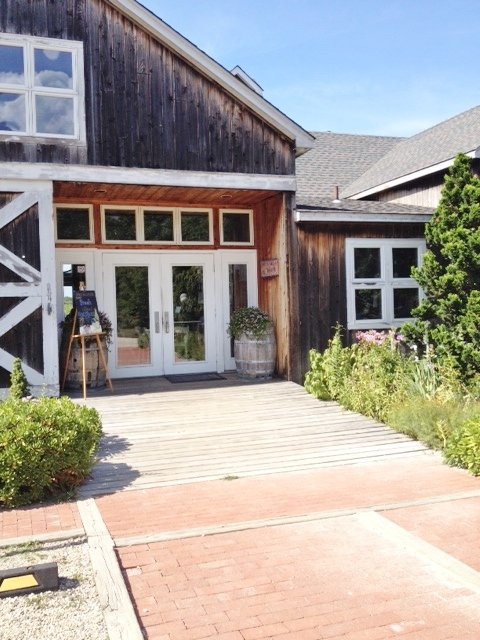 Premium Wine Group—which appears prominently on the sign outside the tasting room—designates the facility attached to it where various wine makers on the North Fork come to use the production facilities, rather than make the rather hefty investment in their own. 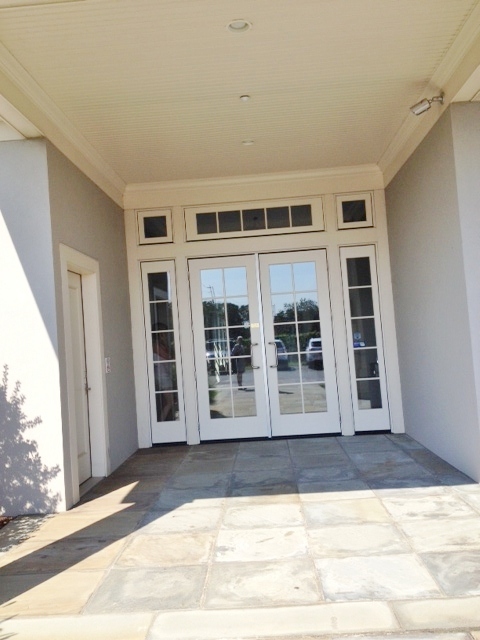 At the far end of the building you can see the entrance to the wine-making facility. What’s unique about the Bridge Lane wines is that they are offered for sale by the bottle, the box, or the keg, giving a whole new dimension to the term “kegger.” A keg holds the equivalent of 26 bottles and, according to our server, is particularly popular for weddings and other large parties. Just to give you a sense of relative costs, a bottle of Bridge Lane Chardonnay is $15, while a box is $40 and a keg is $240. 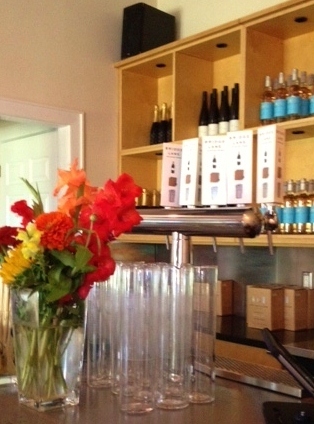 In the tasting room the Bridge Lane wines are poured from the tap, like beer, rather than the bottle. You might think that this all indicates a lesser quality of wine, but we would be perfectly happy to drink most of them. Busy Russell Hearn, who also has his own small label SuHru, is the winemaker for all the wines. 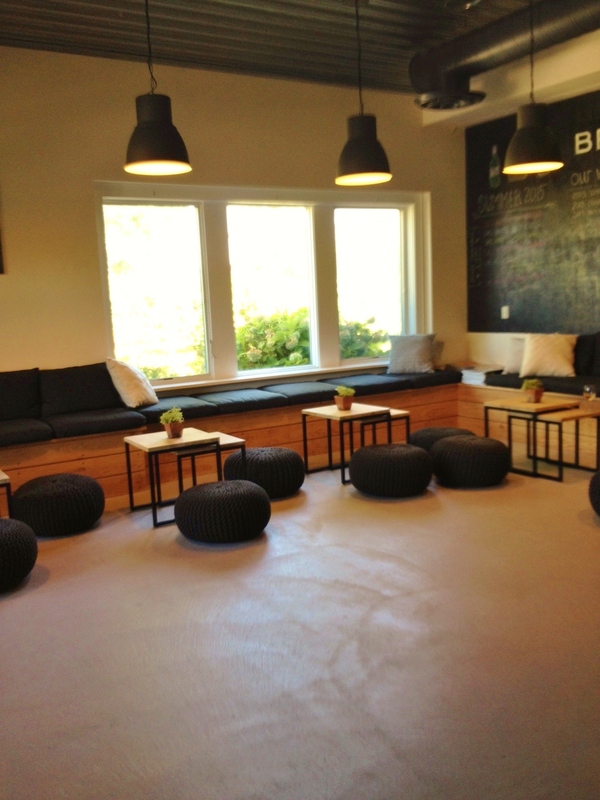 The tasting room is small, set up like a lounge (or, as a certain four year old—non-drinking—visitor opined, “like a living room” ) with a bar on one side and banquettes around the walls. We were there late on a week day, and had the space mostly to ourselves. 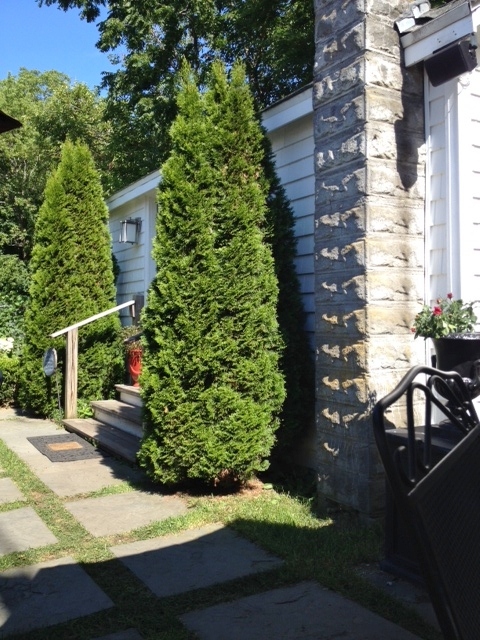 There are also picnic tables and comfortable Adirondack-style chairs outside. 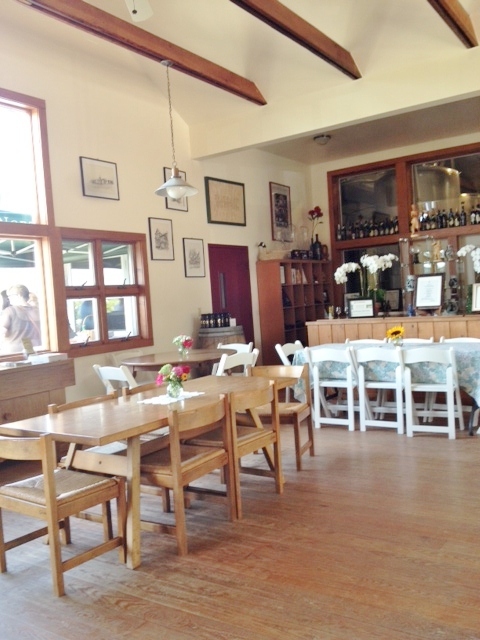 The menu offers five Bridge Lane wines for $12 or five “featured” wines (Lieb label) for $12. We opted for one tasting of each, so we could sample all of them. Packages of crisp skinny bread sticks are on the bar for palate cleansing, and the four-year-old quite approved of them. I list the tastes here in the order we had them, with the Featured selections second, marked with an *. White merlots have become more popular on the North Fork lately, and this one reminds us a bit of Anthony Nappa’s Anomaly, though it is lighter. It is tart and citrusy, a good summer quaff. Yes, that’s $9 per bottle! And you could serve this to wine lovers who would be quite happy to drink it. It is made, as our server informed us, “from ten different varieties of apples,” all grown on the North Fork. It does not taste particularly like a cider, and is tart, crisp and light, with a slight trace of bubbles. 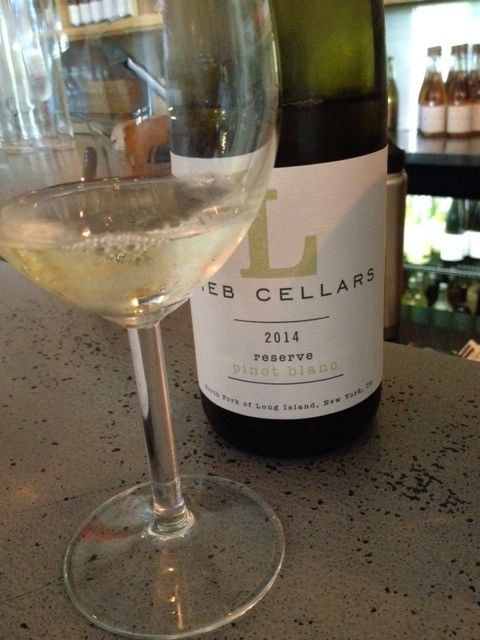 A steel-fermented chard, this has the fairly typical veggie aroma, and tastes citrusy and grassy and tart. 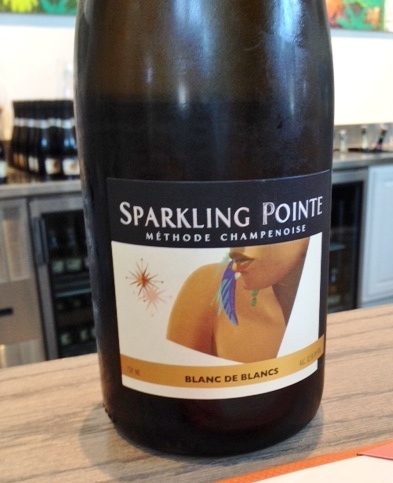 Made from pinot blanc grapes in the Méthode Champenoise, this is their entry in the sparkling wine category. I smell a bit of yeasty bread, taste some green olive taste. It is very dry, and pretty good, though I’d probably get a Cava or Prosecco rather than spend $30 for this level of sparkle. A mixture of 29% chardonnay, 26% pinot blanc, 16% riesling, 14% viognier, 9% sauvignon blanc, and 4% gewürztraminer—everything except the kitchen sink, observes my husband—this is a quite pleasant drink, with a good balance of sweet and tart. When I came here with a group, this one was very popular. The aroma has a bit of the forest floor funk, but the taste is not at all funky. Our server proudly informs us that Lieb has the largest planting of pinot blanc in the United States, which they started in 1983. In any event, this is a delicious wine, with some baked pear aromas and flowery, pineapple-y tastes. The rose sure looks pretty. They make their rosé from a blend of cabernet franc and merlot, and we smell the typical strawberry aroma, taste some fruit. Not complex, no finish, still no competition for Croteaux, but certainly drinkable. This is also very drinkable, a dry soft, very cherry merlot. It spends 10 months in Hungarian oak, which, our server notes, is milder than French oak. No tannins. The pour for the Bridge Lane wines is fairly generous. For $16, this is quite a good everyday red, which I could see enjoying with spaghetti and meatballs any night of the week. It is a Bordeaux-style blend of 46% merlot, 37% cabernet sauvignon, 12% petit verdot, and 5% malbec, with a touch of earth and forest floor as well as dark fruit aromas and good fruit tastes, not sweet. We notice that if one buys three bottles of any wine one tasting is free, and decide three bottles of the Red Blend would be a worthwhile investment. Unfortunately, the red is served a bit too cold, perhaps a result of the tap system. By the way, calling a wine “reserve” means whatever the winery wants it to mean, but usually means they think this is a particularly good wine. They would be correct with this one, which we would buy for our cellar if we had room at the moment. Lots of dark fruit, interesting tannins, it’s a delicious dry red that could stand up to steak. Reasons to visit: you can buy a keg of wine, how cool is that? ; wine on tap; a pleasant calm tasting room (or go to their Oregon Road room if you want to get further off the beaten track); almost all the wines, but for fun the Rumor Mill Cider; more seriously the Reserve Cabernet Franc; for an inexpensive everyday red, the Red Blend or white, the White Blend. 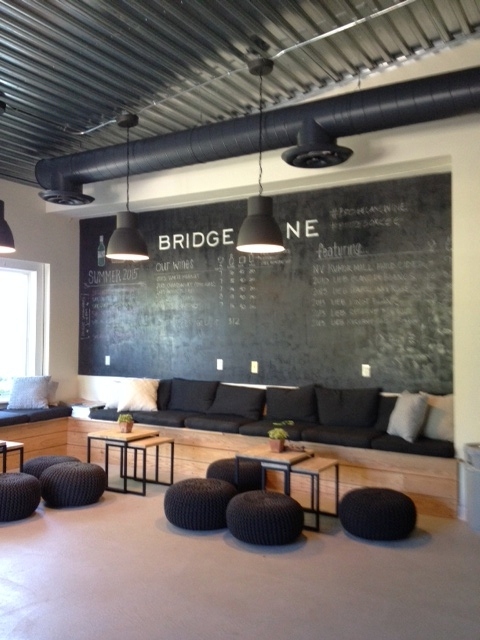 Here you can see the taps from which they dispense the Bridge Lane wines.